Provided photos: Mr. John Bailey, Mrs. Jennifer Trupo, and Mrs. Kristina Best perform a six-handed arrangement of Aram Khachaturian's "Saber Dance" during the "Music in our Schools" Prism concert at Lyndonville Central School last Tuesday. 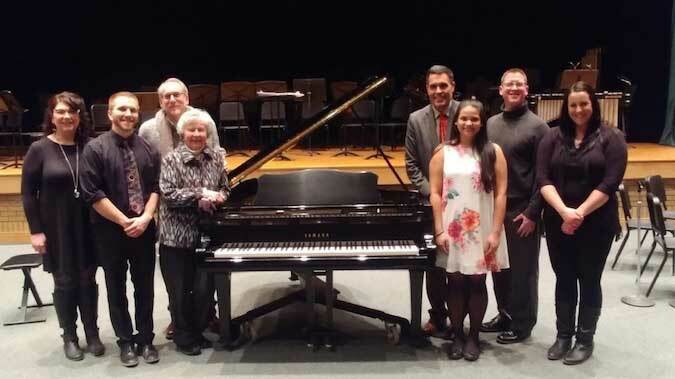 The special performance inaugurated a new Yamaha baby grand piano purchased by the district and two community organizations: the Lyndonville Music Boosters and the Lyndonville Area Foundation. LYNDONVILLE – March is recognized nationally as “Music In Our Schools” month. In recognition of this, the Lyndonville Music Department hosts an annual “Prism” concert showcasing its top musical talent through a variety of small ensemble performances. Only select musicians are invited to participate from grades 5-12. The concert is fast paced, with one performance beginning as soon as another ends, featuring both instrumental and vocal groups. It is normally a solid 1 ½ to 2 hours of fantastic music with no interruption, however last Tuesday night was an exception. Tamara Huzair, a senior at LCS who intends to pursue a career in music, took to the microphone half way through the concert. “As a special part of tonight’s concert, we are unveiling the new baby grand piano you see before you,” Tamara told the audience. With joint financial support from the Lyndonville Music Boosters, Lyndonville Central School and the Lyndonville Area Foundation, the funds were secured for this instrument. This piano truly represents all the hard work, dedication and collaboration from every facet of the community that helps create the wonderful music program we have here, Tamara said. Pictured with the new piano include from left: Jennifer Neroni-Trupo, vocal music instructor; John Bailey, elementary instrumental instructor; Darren Wilson and Rita Wolfe, President and Vice President of the Lyndonville Area Foundation; Jason Smith, Superintendent of Lyndonville Central School; Tamara Huzair, senior music student; Patrick Whipple, Vice President of the Lyndonville Music Boosters; and Kristina Best, high school instrumental instructor. Dillenbeck, while helping to set up for a Christmas concert last December, joked with elementary instrumental instructor John Bailey that the piano currently used in performances was showing significant signs of wear and age. 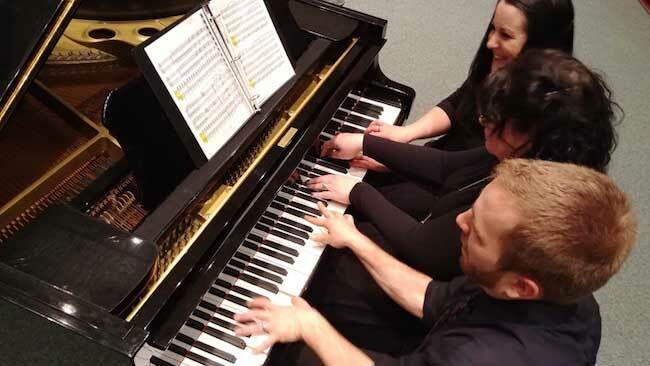 Darren Wilson, president of the Lyndonville Area Foundation who attended the concert that night, also mentioned that the piano had perhaps reached the end of its useful life. Ironically, late that evening, after the concert had concluded, vocal music instructor Jennifer Trupo noticed an important post on Facebook. “Tom Miller of Miller Piano Service posted some photos on Facebook of this beautiful Yamaha piano for a great price,” Trupo said. “There was immediately interest from other potential buyers, so I knew we had to jump at it right away before it was purchased by somebody else!” The next day, Music Boosters officers set out to acquire the instrument. They immediately approved a non-refundable down payment, and sought to partner with other organizations to secure full funding before the deadline to purchase passed. They applied for a grant from the Lyndonville Area Foundation, and asked for a matching donation from the district. Thankfully, both the district and Foundation jumped at the opportunity to be involved, and the piano was purchased with equal contributions from all. 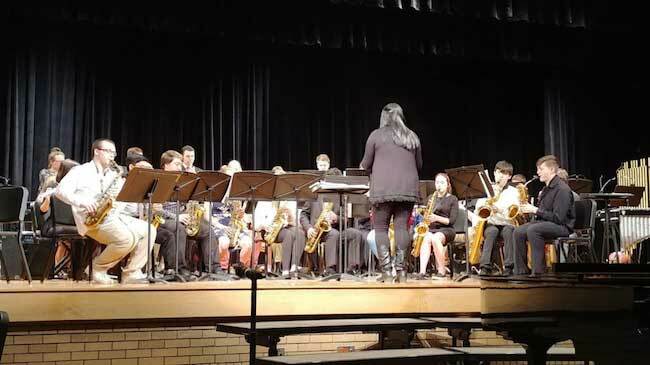 The Lyndonville high school jazz band, directed by Kristina Best, was the final performance of this year’s “Music In Our Schools” PRISM concert which involved vocal and instrumental music students in grades 5-12. All three organizations hope that the procurement of this beautiful piano will increase the quality of events they host in the future. The Boosters and district are excited to show off the piano for the whole county next year as they host one of the two high school All-County music festivals scheduled.